The Nigerian Army on Saturday said its troops had arrested two alleged masterminds of the killings in the Takum and Ussa Local Government Areas of Taraba State. The suspects were identified as Mr. Danjuma and Mr. Danasebe Gasama. According to the Director, Army Public Relations, Brig. 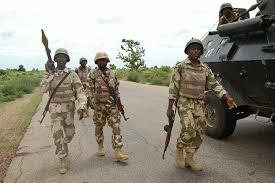 Gen. Texas Chukwu, Danjuma, also known as American and Gasama were picked on Friday by troops deployed for Operation Ayem Akpatuma in a community in Takum, following a tip-off. Meanwhile, the Taraba State Government, on Saturday, expressed shocks over the sudden withdrawal of military personnel deployed to enforce peace and security in the southern part of the state. In a statement by the Senior Special Assistant to the Governor on Media and Publicity, Mr. Bala Dan-Abu, the state government lamented what they described as the “unceremonious withdrawal” of the troops. “The surprise is that no reason was given for the withdrawal and government was not aware. At the moment, the reason for the withdrawal of the soldiers is not known to us,” the statement added.